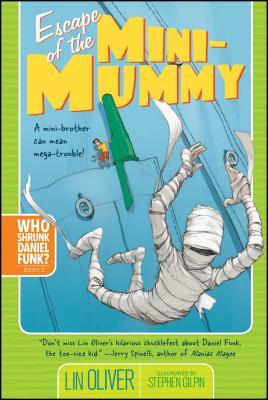 Simon & Schuster Books for Young Readers, 9781416909606, 160pp. Daniel Funk always wanted a brother, but he’s got three sisters instead. Until he shrinks to the size of a toe—and discovers Pablo, his twin brother who’s always that small! Together, they have mountains of tiny-size fun. In Attack of the Growling Eyeballs, they release a hissing cockroach at one of their sister’s slumber party and learn that tiny-size trouble can cause mega-size danger. In Escape of the Mini-Mummy, Daniel enters the school diorama contest against Vince the Pizza Prince. Pablo comes along, disguised as a toilet-papered mummy. Can Pablo help Daniel win big, or will he create big-time Egyptian chaos?